Yesterday (Wednesday) I was lucky enough to go to the movies and see the movie Dark Night. (Which is the latest Batman movie). Now it's fair to say that i'm not usually a comic book movie fan and that I thought the first Batman movie in this particular series of Batman movies directed by Chris Nolan was pretty good but nothing special. Dark Night however was something else. It was gripping, scary, funny, exciting, action packed. A great movie. A must see in a cinema with a big screen and a big sound!! The movie gets 5 stars from me! 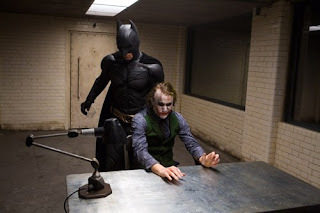 Plus it is Australia's very own Heath Ledger's last full film that he acted in before he died. He played the Joker and did a fine fine job! You all MUST see this movie at the cinema.